The Southern Utah Thunderbirds travel to Taco Bell Arena to play the Boise State Broncos on Sunday, November 12, 2017. Southern Utah heads into this matchup after finishing last year with a mark of 5-26. They had a point differential of -7.7 as they averaged 77.5 points per contest while giving up 85.3 per game. Boise State had an overall record of 19-10 last season. They averaged 75.8 points per game and surrendered 71.3, good for a point differential of 4.5. Randy Onwuasor averaged 23.6 points per game while playing 35 minutes per night last season. He pulled down 6.6 rebounds per game and dished out 3.2 assists per game as well. His field goal percentage was 50% while his free throw percentage finished at 83%. James McGee averaged 14.2 points per game in 33.8 minutes per contest last season. He averaged 2.5 assists per contest and 2.7 rebounds per game. His field goal percentage was 40% for the year while his free throw percentage was 72%. Chandler Hutchison averaged 17.4 points per game while playing 31.7 minutes per contest last year. He grabbed 7.8 rebounds per game and had 2.6 assists per contest on the year. His field goal percentage was 50% and his free throw percentage was at 67%. Paris Austin averaged 12.3 points per game last season and he saw the court an average of 28.5 minutes per contest. He also averaged 3.4 rebounds per contest and 2.8 assists per game. His field goal percentage was 49% and his free throw percentage was 76%. Southern Utah averaged 77.5 points per contest last season, which ranked them 78th in the nation. Their average scoring margin was -7.7 and their shooting percentage was 41% as a team, which had them ranked 324th. Behind the arc they shot 36% which was good for 145th in the country. They averaged 36.9 rebounds per game and 11.5 assists per game, which ranked them 111th and 295th in those offensive categories. In the turnover department they ranked 105th with 13.7 per game. The Thunderbirds allowed 85.3 points per game to their opponents which ranked them 348th in Division 1. They also allowed a 48% shooting percentage and a 39% average from behind the arc, ranking them 337th and 331st in those defensive categories. Opponents averaged 37.3 rebounds a game which ranked 283rd and they gave up 15.3 assists per contest, which put them in 315th place in college basketball. They forced 12.5 turnovers per game which ranked them 121st in the nation. Boise State was 113th in the country with 75.8 points per game last year. They were 128th in D-1 in shooting at 45%, while their average scoring margin was 4.5. They shot 36% from 3-point range, which was good for 147th in college basketball. They were 186th in the nation in rebounding with 35.7 boards per game, and 245th in assists per contest with 12.5. The Broncos were 212th in turnovers per game with 12.8. The Broncos surrendered 71.3 points per contest, which ranked them 153rd in the country. Their defense allowed a 43% shooting percentage and a 34% average from 3-point range, ranking them 114th and 102nd in those defensive statistics. They ranked 53rd with 11.5 assists allowed per contest and 93rd with 33.6 rebounds surrendered per game. The Broncos were 66th in Division 1 in forcing turnovers with 11.7 per game last season. The Thunderbirds were 183rd in the nation last year in offensive rating with 103.5, and their defensive rating of 113.8 was ranked 344th. In terms of pace they were 26th in the country with 74.1 possessions per 40 minutes, and their effective field goal percentage of 48% was 299th. As a team they were 236th in college basketball in true shooting percentage with 53% and they shot 3-pointers on 41% of their shots, ranking 71st in Division 1. Southern Utah was 214th in turnovers, as they turned the ball over an average of 15.9 times per 100 possessions while forcing 15 on the defensive end. Their defensive effective field goal percentage for the season was 55%, which was 341st in the nation. Boise State was 187th in the country in turnovers last year, as they turned the ball over an average of 16.1 times per 100 possessions while forcing 14.9 on defense. Their defensive eFG% for the year was 48%, which was 64th in Division 1. The Broncos were 143rd in the nation in defensive rating with 101.2, and their offensive rating of 107.6 was ranked 105th. They were 128th in D-1 in pace with 70.5 possessions per 40 minutes, and their eFG% of 53% was 99th. As a unit they were 79th in college basketball in true shooting percentage with 56% and they shot 3-pointers on 41% of their shot attempts, ranking 69th in the country. 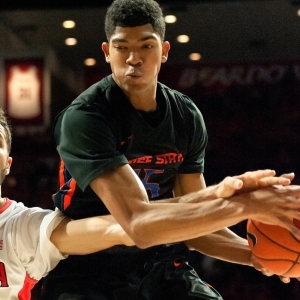 Who will win tonight's Southern Utah/Boise State college basketball game against the spread?